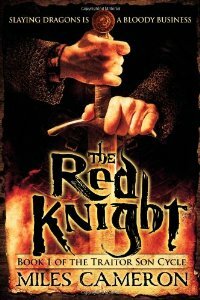 The Red Knight has all three, he has youth on his side, and he’s determined to turn a profit. So when he hires his company out to protect an Abbess and her nunnery it’s just another job. The abbey is rich, the nuns are pretty and the monster preying on them is nothing he can’t deal with. 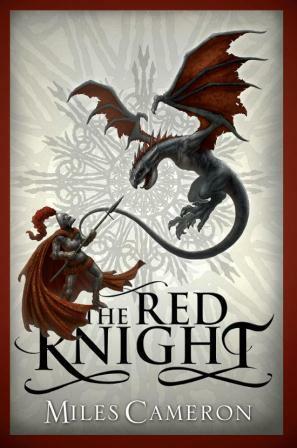 I’ll be honest – it took me a while to read The Red Knight by Miles Cameron. Before I say anything else, I have to mention that Cameron’s prose is just a joy to read and that I found this to be beautifully written. Some books or prose I read at a faster rate than others, and this one was definitely along the slower end of the scale. However, I need to keep in mind that reading a book is not a race. When I get a long book that is also a slower read, I need to remind myself that I am getting more enjoyment for my money. The whole point of a story is to experience the journey the words take you on, regardless of how much time it takes. And this is really quite a journey. The cast in this book is on an epic scale and the POVs switch often. In the beginning I sometimes felt they would switch before I could get a handle on who I was reading about. So I have to admit, it took me longer to get the characters straight than a typical epic fantasy, longer in fact than any other book I have read. But don’t worry, it does come together. The story could at first glance be seen as a classic good versus evil tale, men with their golden magic versus the Wild with their less savory green magic. But Cameron shows us both sides of the conflict, making the division less clear. The leader of the Wild, Thorn, is certainly a villain. But the armies he has raised are comprised not only of creatures of the Wild, but also men and women who have shunned their society, that have chosen for one reason or another to live as outcasts from the rest of civilization and live their life in the wild. These men and creatures are fighting a war dictated by Thorn. We get to see these are not evil creatures or men, they are soldiers fighting at someone else’s command to reclaim lands that they believe to be rightfully theirs. So who is on the moral right side of this war? Is it the men who see the Wild as invading their home and land? Or is it the Wild who once called that same land home? It’s much harder to view something as simple black and white or good and evil when you start to understand both sides. It’s at that point everything becomes grey and it’s hard to point fingers and say one side is in the wrong or the other in the right. The cast in this book may have been quite large, but Cameron succeeded in differentiating them and giving them each unique qualities and making them real and likable. I particularly liked the Red Knight who is a natural leader, yet still fallible, which he knows. This gives him a more honest realistic or humanized feel. He also has a mysterious past that gives the reader more to wonder about as they are introduced to the world. If you feel you are going to need to rush through your next book, this is likely not for you. There is an investment of time involved to really let Cameron take you about the world and get acquainted with the characters and rising conflicts. But if you have the time, Cameron’s prose is superb and I promise, everything does fall into place, and trust me, there is certainly lots of action in the book. And bloodshed. Lots. Cameron’s amazing prose is paired with some horrific events. This is very much an epic book, and is really just the beginning of a much larger story. Sometimes I wished there were less characters or fewer POVs, but by the end, I was no longer so sure. I think the test of that will actually come in the next book as we see how these characters and their storylines progress past what we have seen so far. And with that, I certainly plan on reading the next one to find out. Worked better for you than for me. I thought it read like a non-fantasy writer doing fantasy and thinking he was doing it new, but was really just rehashing old things in a more historical fiction voice. Some great set pieces though.